The ELBAR GARDEN HANGOUT (160 sq. ft.) — ideal as an office, studio, exercise room, game room, or just as a great hangout. All you need is an area 8′ x 20′ on your property. That’s all. The ELBAR COTTAGE (320 sq. ft.), ELBAR MANSION (640 sq. ft.), and ELBAR ESTATE (960 sq. ft.) — each is ideal as a vacation cabin, retirement home, student accommodation, guest house, or for those looking to down-size. Building with shipping containers now is becoming a lot more popular, as eco-friendly practices begin to influence market trends. Containers are loved by the hip and practical, artisans, DIY-ers, engineers, and construction foremen, since they are both sustainable and affordable. So it’s not surprising that some industry professionals consider them the future of home building. ultra-comfortable, great to live in, and lovely to look at. Your ELBAR Tiny Living Home is ready to go. 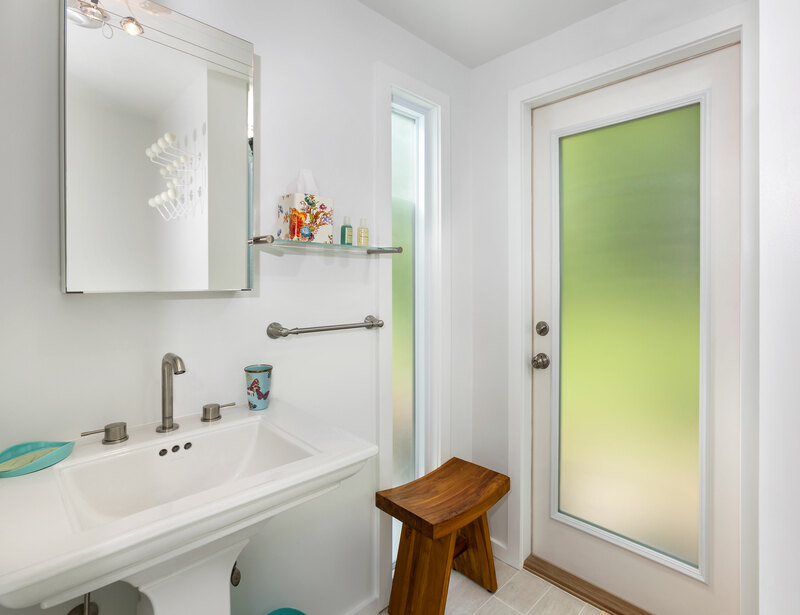 It includes an indoor shower stall, two sinks, a bathroom (two bathrooms in the ELBAR Estate), a kitchen area, refrigerator, indoor LED lighting, HVAC system, hot water heater, electrical wiring and plumbing. Each ELBAR Tiny Living Home is built from a Corten steel shipping container. It can withstand severe weather conditions, even most tornadoes and hurricanes. An ELBAR Tiny Living Home can be constructed, equipped, and delivered to your property within four weeks after the order is placed; the larger models within two months. "The coolest homes and offices are made out of shipping containers." 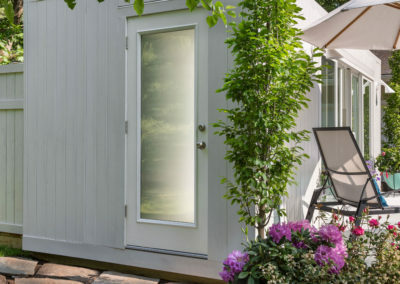 It all began when Barbara Rose decided to build a quiet retreat in her back yard. She contacted Matt Menozzi, a contractor with 20 years experience, to handle the job. She couldn’t believe what he told her: building this tiny 160 sq. ft. house would be almost as time-consuming and complex as building a home of 3,000 sq. ft. She would need an architect to draw up plans, schedule a construction crew, and make difficult decisions about buying the right materials, equipment, and appliances. 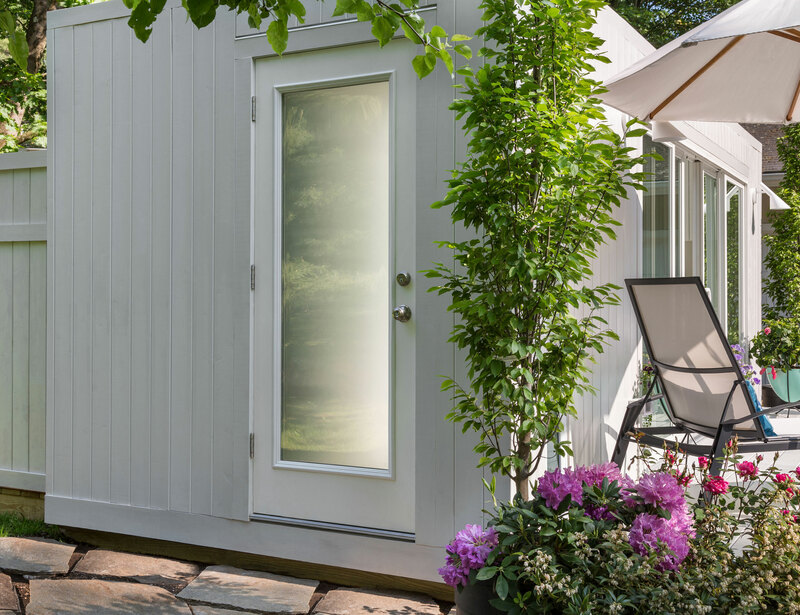 She got excited after reading an article in Architectural Digest that revealed the huge breakthroughs in building homes utilizing steel shipping containers. The article included photos of such homes, one more beautiful than the other. Enthusiastically, Barbara and Matt concluded that here indeed was the makings of a viable business. It was the wave of the future! Barbara, Matt, and their partner, Elliott Kanbar, co-founded ELBAR Tiny Living. The goal is to provide buyers with a fully constructed and equipped house that could be delivered anywhere, within four weeks after the order is placed. It would remove the worry and stress buyers often encounter when they venture into home construction. 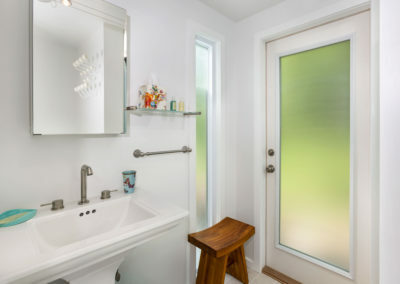 He has been building and renovating homes in Fairfield County, Connecticut for over 20 years. He works with an experienced construction crew and knows how to navigate the complex hurdles of obtaining permits and approvals. His access to important wholesalers in every phase of construction ensures that he’ll be buying at the best prices available. 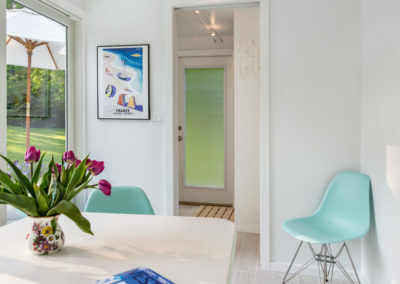 She has designed and decorated homes in New York, Palm Beach, and Westport, Connecticut. Her aim is to make sure that the pool house is not only stunning, but also practical. This includes purchasing all the right appliances, and selecting the siding, flooring, and the cabinetry. She can also assist buyers in furnishing their Tiny Home. This is an ideal hangout, office, studio, game room, or a quiet retreat. "Shipping container homes are faster, cheaper, and now potentially have much more of an esthetic range." Wood blocks or slab base. Foundation not necessary. Do I Need Permits or Approvals? Most towns will require permits and approvals. This will be your responsibility, but we can assist. Since our ELBAR Tiny Living Homes are constructed from steel shipping containers, they can be transported anywhere in the world. Will I Need a Contractor? A local contractor is needed to hook up the electricity, gas, water, and sewerage/septic. Since there is no basement, a foundation is not necessary. However the contractor will need to place wooden blocks or a concrete slab on which the Tiny Living Home will be placed. Each container weighs 5,000 lbs so it will not move or shake even in a violent storm. Can I Install the Tiny Home On Sloping Land? Yes, as long as the site is accessible. 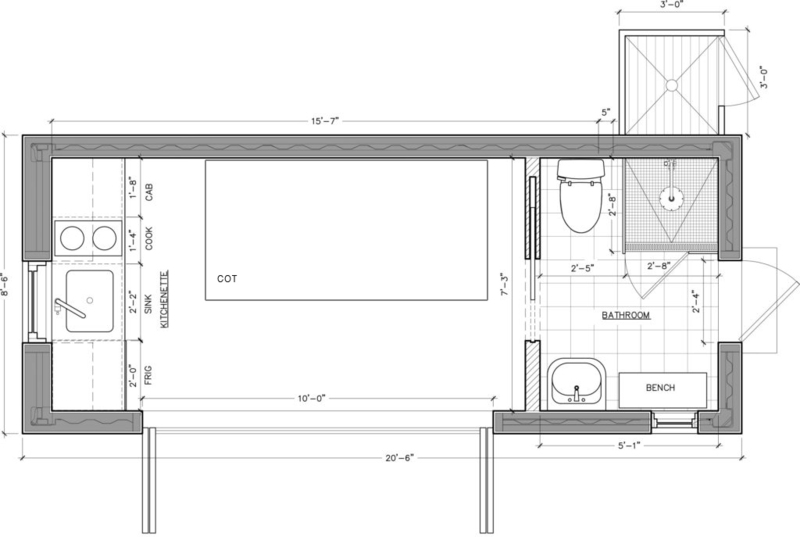 Can I Custom Design My Tiny Home? Yes, as long as we can utilize steel shipping containers to do so. Steel shipping containers come in two sizes: 8′ x 20′ and 8′ x 40′. They can be placed side by side or stacked one on top of the other. We can also change the siding, the flooring, and the appliances. We can build houses that are contemporary, colonial, cape, as simple as a saltbox or cutting-edge modern. We can also add small touches like hand-crafted cabinetry, shutters, window and corner trim, and a cupola and weather vane on the roof. And, of course, you can choose the interior and exterior colors. Some changes will result in additional costs. An ELBAR Garden Hangout can be constructed, equipped, and delivered to your property within four weeks after the order is placed; the larger models within two months. Will the Tiny Home Be Furnished? The cost of furnishings is additional, but we can assist. Will the Tiny Home Be Air-Conditioned and Heated? Air conditioning and heating are standard. Will the Tiny Home Be Energy-Efficient? Foam spray insulation is utilized producing a rating of R-21 for the walls and R-35 for the ceiling. This will ensure that the house will be cool in the summer and warm in the winter. Energy-efficient LED lighting utilized throughout the interior of the house. You possibly can obtain financing. Much will depend on the appraised value of your primary residence, financial worth, outstanding loans, and your credit rating. Factory warranties, when applicable, are provided. ELBAR also provides a one-year warranty against any defects in the construction of the home. Once you approve the plan and sign the agreement, a 10% deposit will be required. The balance is due two-weeks prior to delivery. Can the Tiny Home be placed on a base with wheels? Yes, for an additional cost. Will an ELBAR Garden Hangout in my backyard increase the value of my home?